Cleaning some files, I came across a letter written in 1928 from my Great-Grandfather to his Granddaughter, my Mother (when she was 12). Consider what he passed on in this one, simple letter. “We hail this child as one of the coming generation as one of those who are to take up the torch of progress which is beginning to totter in older hands. Age is creeping upon us all, but thank God youth is springing up all around us to take up the problems we have left unfinished. We wish for this child, therefore, and all children, a sounder body than our own, a stronger mind, and a purer soul. Let her be vigorous and strong for no one can help the inefficient except those who have stores of strength in themselves. Let her mind be furnished with sound knowledge and the training of a deep wisdom. One’s value to the world is coming more and more to mean the value of her mind. May she have quick and strong hands but above all may they be directed by a straight-thinking and active brain. But most of all, we wish for her cleanness of soul and that highness of ideals that shall equip her nobly to bear her part in the drama of life. We who are older look back with regret upon much that we have done. May she learn from our experience and profit by our mistakes. What does it mean to us to wish this young voyager success as she is getting under way for her life? May she successfully outlive all storms. May her ship staunchly buffet the waves and may at last she reach port crowned with success. We ourselves have lived in a wonderful age. Some of us have seen the rise of the telephone, the radio, and the airplane. What greater wonders shall she not see? We envy the part that she may play in her generation. We hand you a world cursed with war and all forms of insanity. May it be yours to help make this world a better place to live in. May you be free from superstition and the travails of the past. May you have the boldness enough to carry out your profoundest convictions. The interesting thing about this earth is not that men die but that life continues. Go tell it to the stars about that, one, this planet, the earth, greens every spring and flowers bloom anew and, two, new and lusty youth keep up the program of life where their elders lay it down. Go, therefore, O Child of Promise, to greet better days. May your hands and feet be unshackled from the fetters of fear. 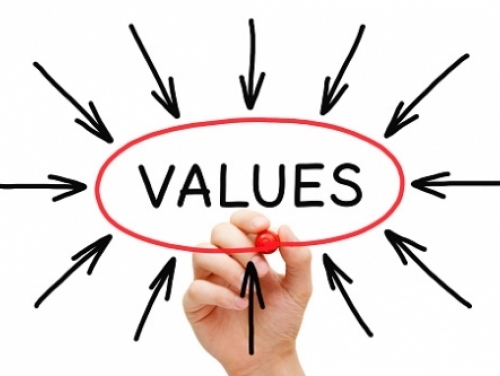 So, can Values be bequeathed? Think about it. Consider you own values. How will you pass them into the future?